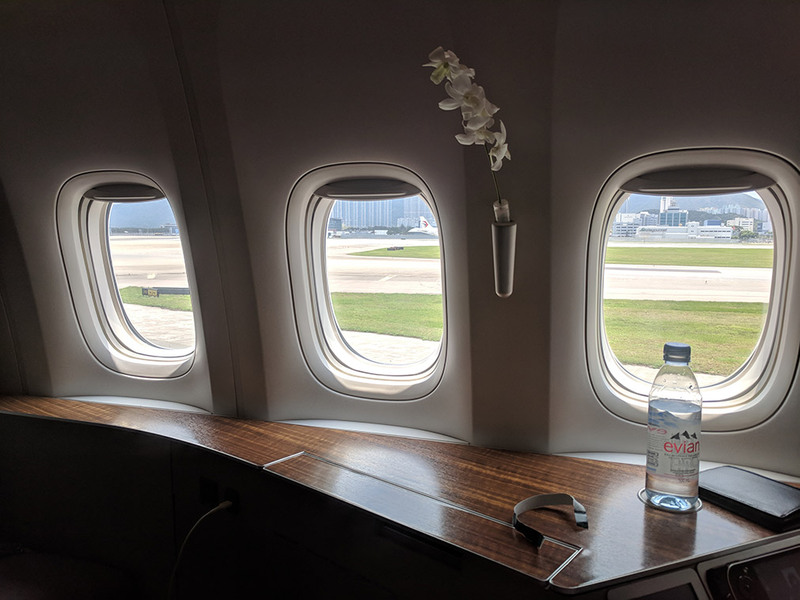 I decided to go from 70k to 110k AA miles to spring for first class rather than business on my way home home HKG. 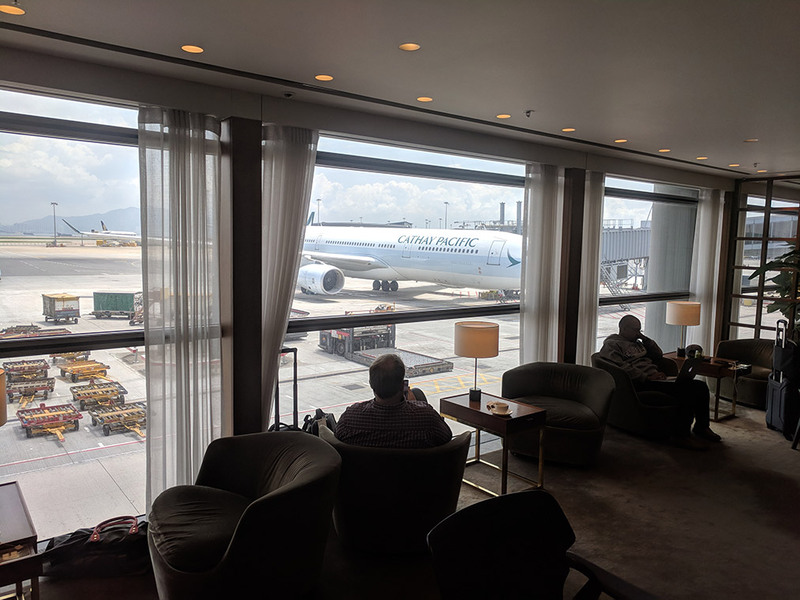 Cathay Pacific is well known for their suites so I figured I would try one out to see what the experience is really like. 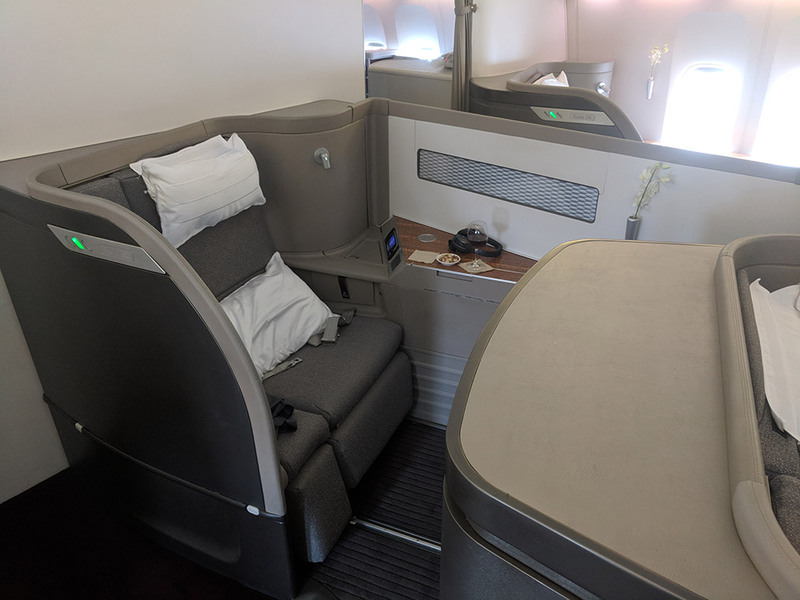 This is probably my priciest flight redemption – I’d estimate at least $15k. 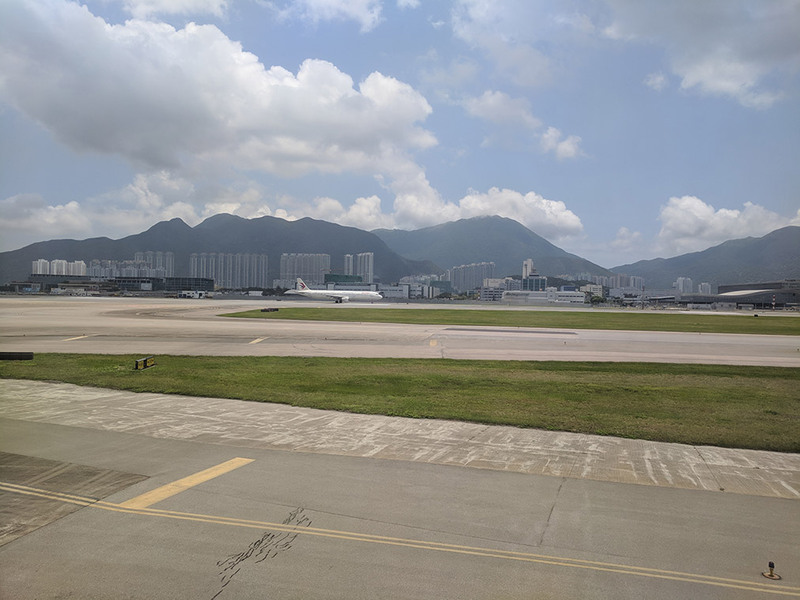 Currently round trips are pricing out for over 22k; the one way I took from HKG-ORD is over 18k. That’s quite a lot of money! I really don’t know who is actually out there paying these wild prices! I spent the evening in Hong Kong catching up and going out with a friend I knew from college. 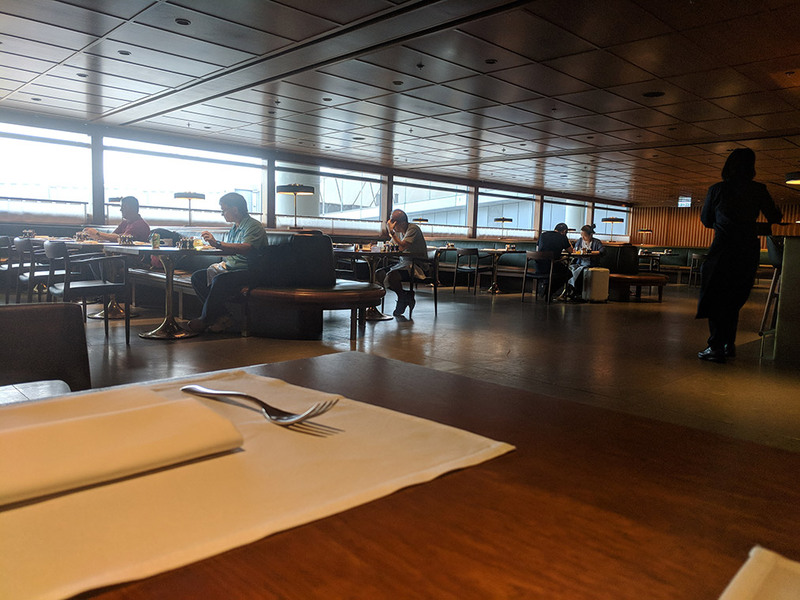 Ended up getting to the airport later than planned, so I did not check out every one of the many Cathay Pacific Lounges. I ended up at the first class The Pier. 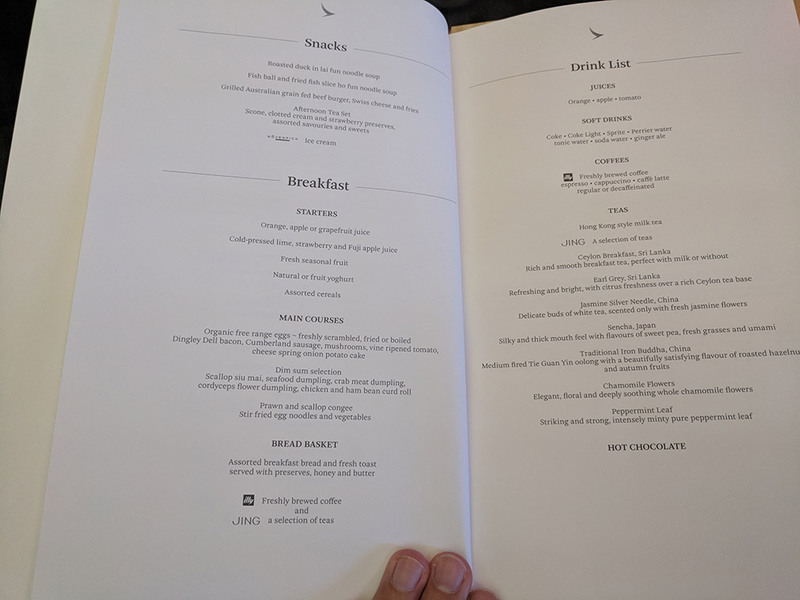 I’m not a big fan of breakfasts and really wish I asked for a lunch/dinner menu. 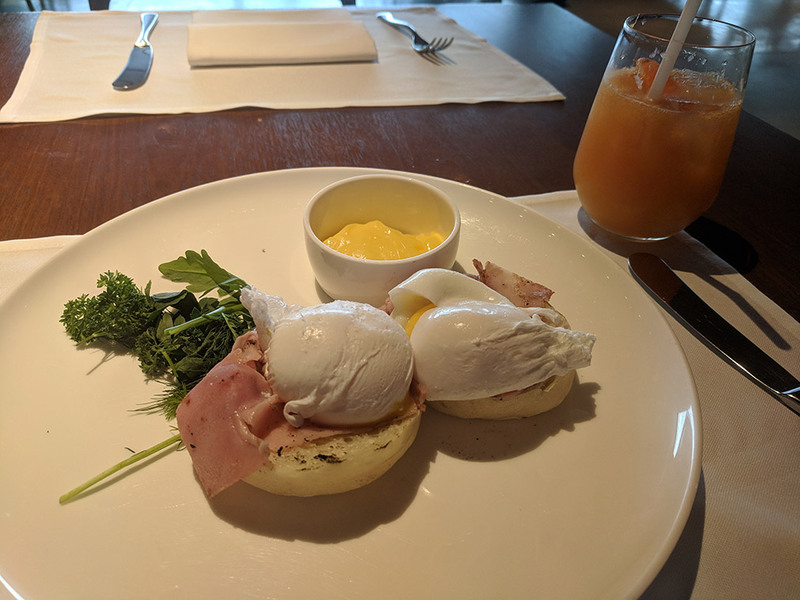 However I didn’t have a ton of time and figured I’d have plenty to eat on the plane – so I went with a breakfast item and got an Eggs Benedict with some nicely poached eggs. There’s 2 rows of 3 suites. 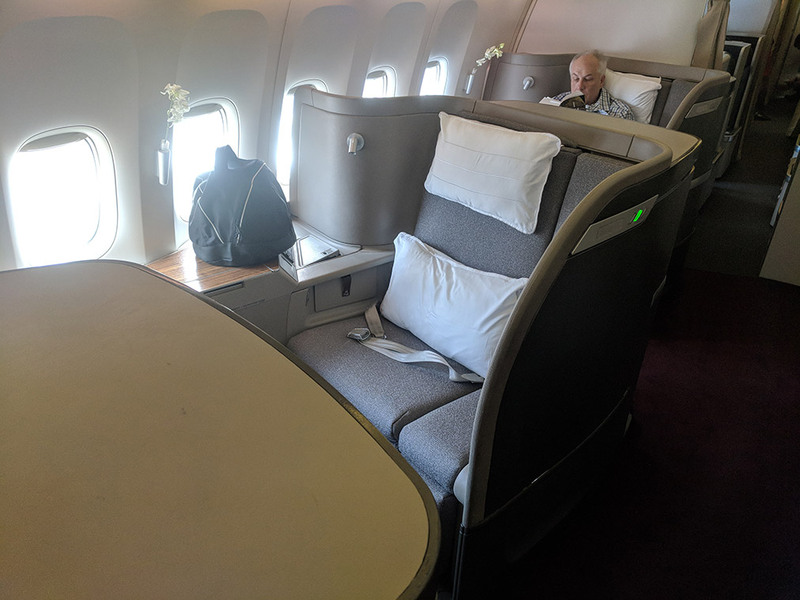 The seats are quite wide; they also have a ton of space when fully flat. 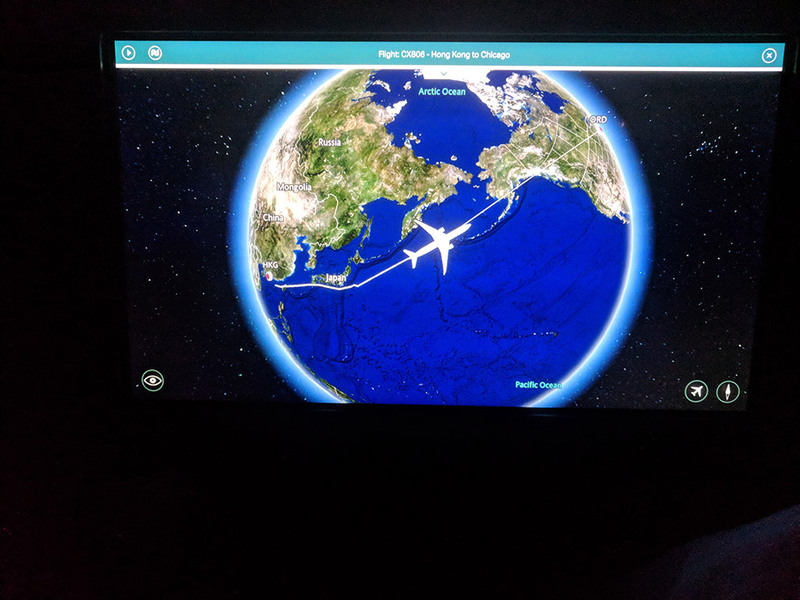 I’m 6’2″ – laying straight, with my feet pointed toes down – and neither my head nor my toes hit the edge of the bed/seat! 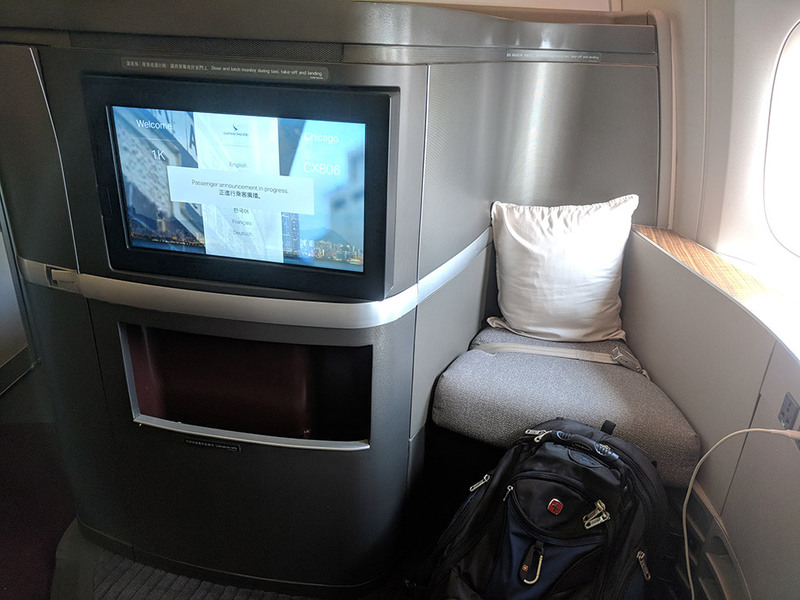 That’s really quite a lot of space, can’t say that’s remotely the case in any other seat I’ve been in. The seat across from you has a seatbelt, with the intent to provide a spot for a companion to join you. 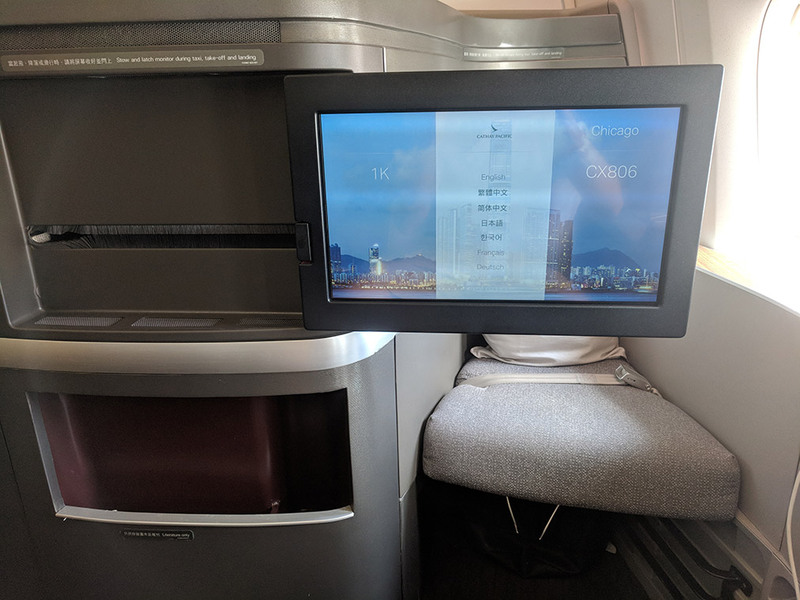 The screen slides out if you’d rather watch a movie than talk to them. 😉 Interestingly enough the movie selection did not appear to contain as many new movies as there were on my way out to Bali a month earlier. I think this was the first time I’ve had slippers that were well sized for my US size 12/13 feet. 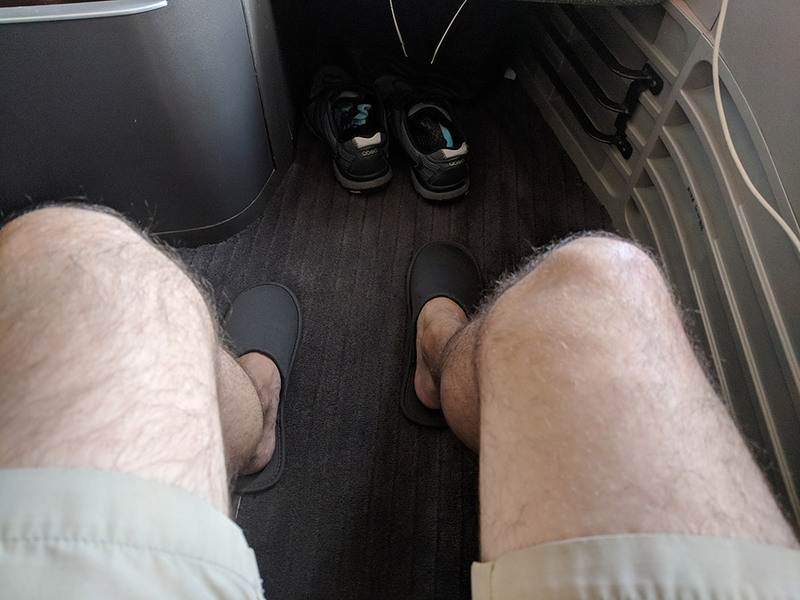 Apologies for turning you on a bit too much with these legs. 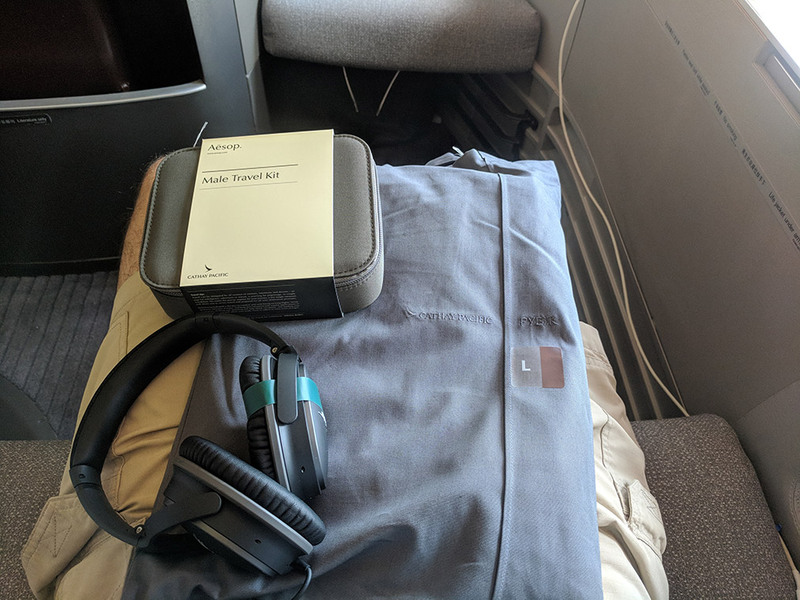 I didn’t use the amenity kit. 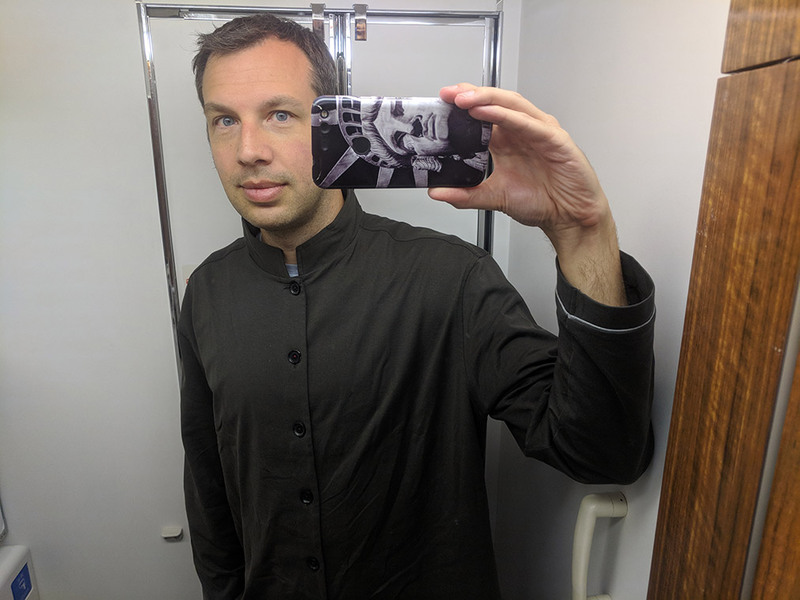 Although you can compare the pajamas to my grandpa ones on the JAL flight out. I think there’s multiple fancy champagnes I was supposed to choose from to go with this, including Krug 2004, oops. 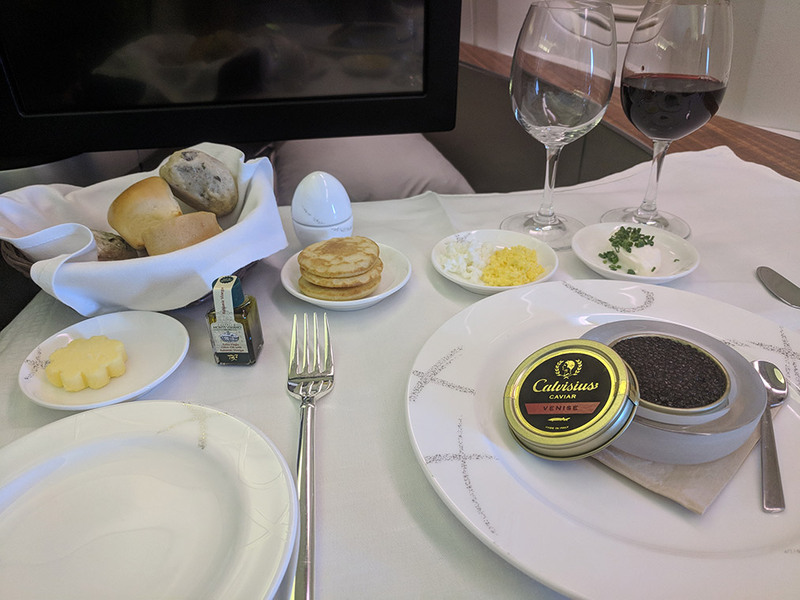 This was my first time having caviar. It appears to be Calvisius Siberian Classic. I won’t be rushing out to buy any any time too soon; however I thought it was pretty good. I’d welcome a plate of it to start my meal again. 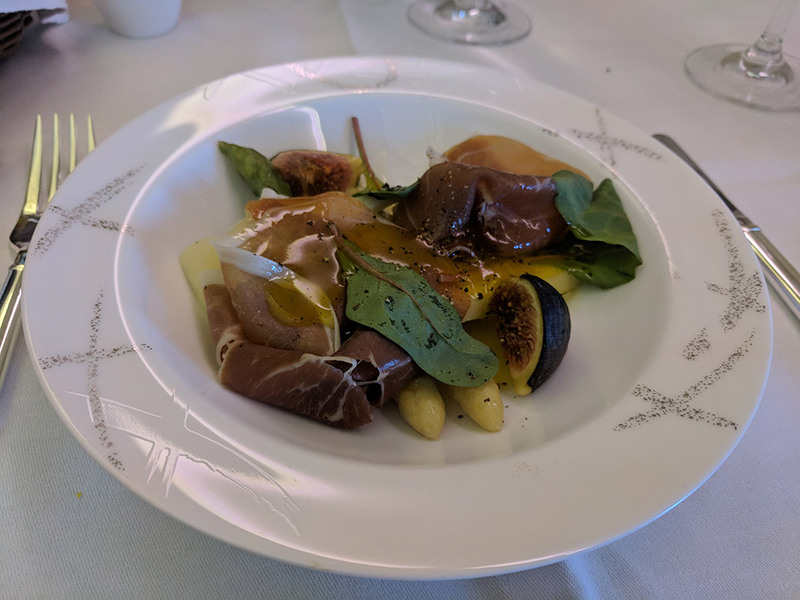 The parma ham with green and white asparagus was quite tasty. I had the beef. How much of this garlic am I actually supposed to pound down? This was a pretty serious sized piece of meat. 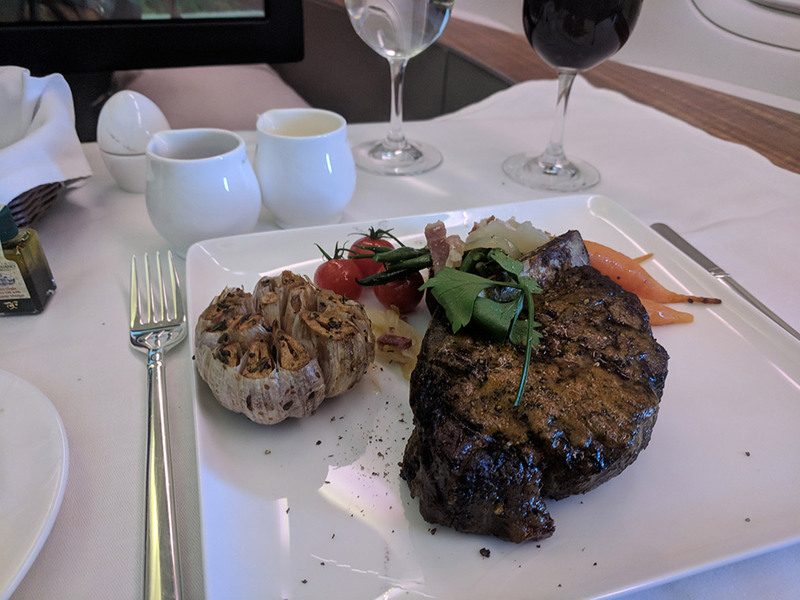 I wouldn’t call it my favorite piece of beef that I’ve had on a plane, but it was good and filling. 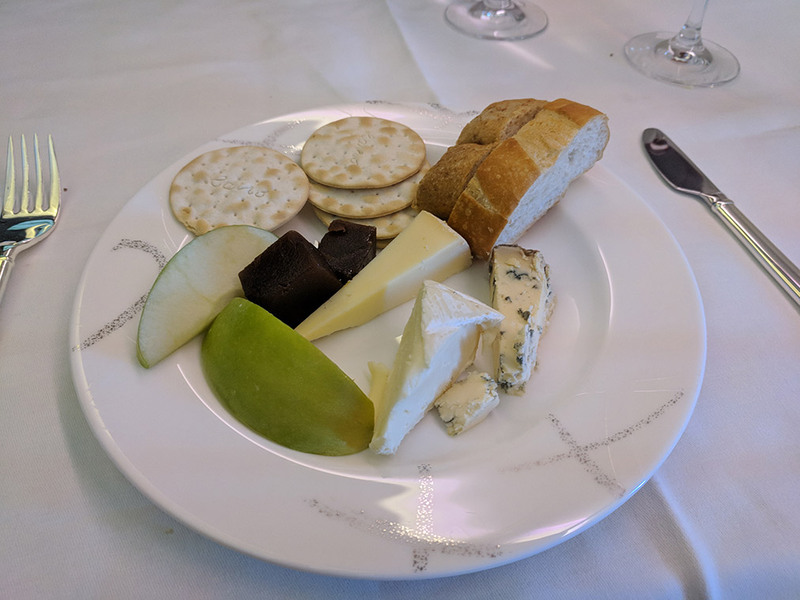 The cheese plate was nice and plentiful. 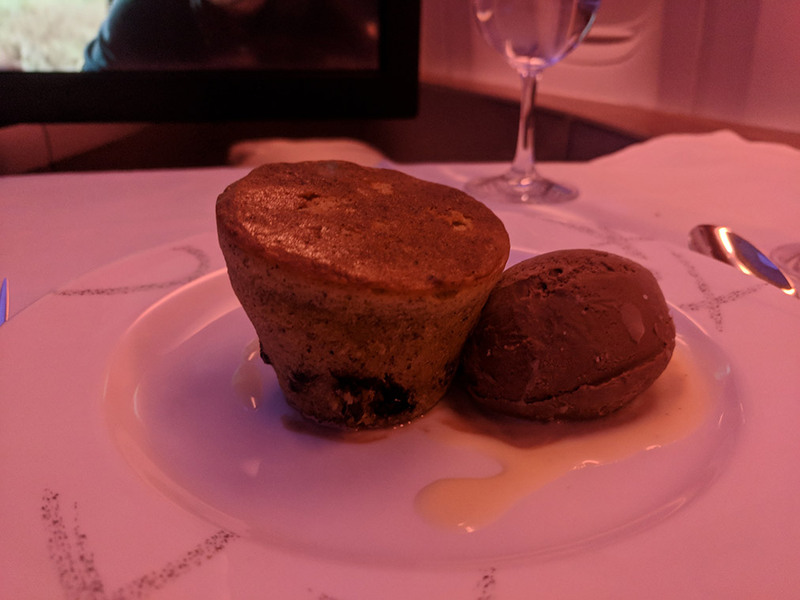 I had the hazelnut cake, with chocolate ice cream and vanilla sauce. It was quite delicious. 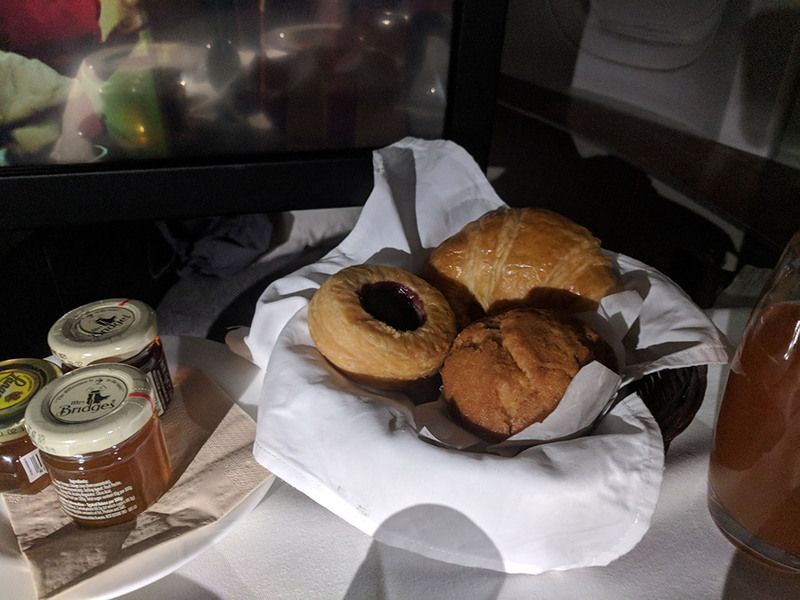 I don’t usually try any of the a la carte items, but this was a long flight and hey – it was Cathay first class! I should certainly try something out. I tried the burger. Looked nice, but the patty wasn’t that great. 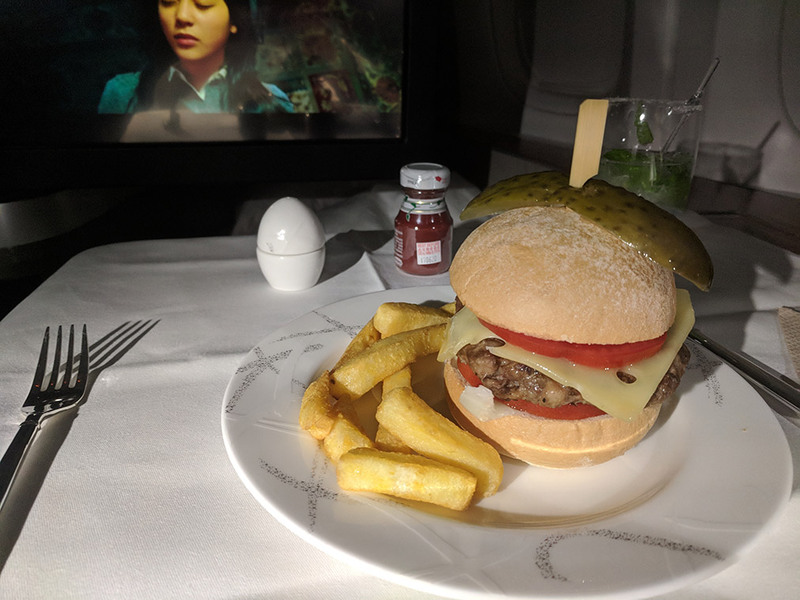 The beef patty makes or breaks a good burger of course – and I wouldn’t call this one first class quality at all. I suppose it’s a bit understandable for a rarely ordered a la carte item however. 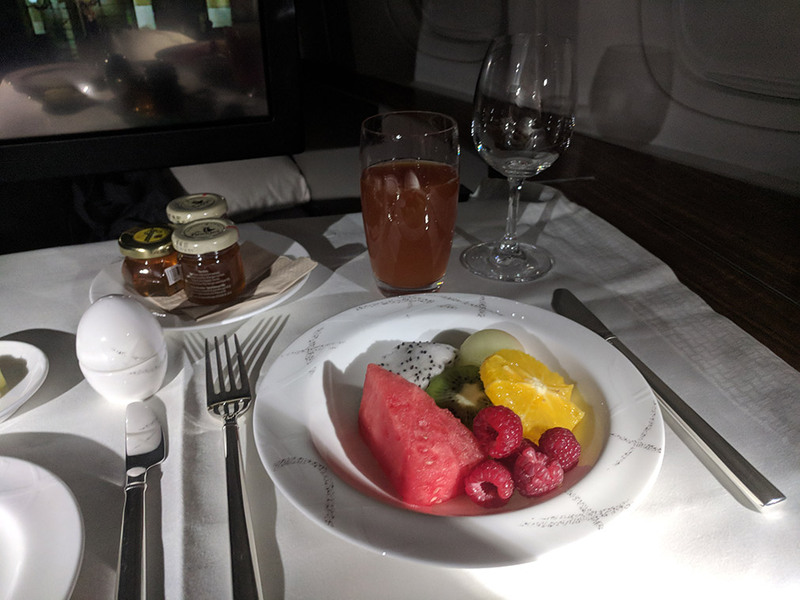 Time for breakfast, starting off with a nice fruit plate. I also had a yogurt. The bread basket had a lot of great options and I had a bit of everything. 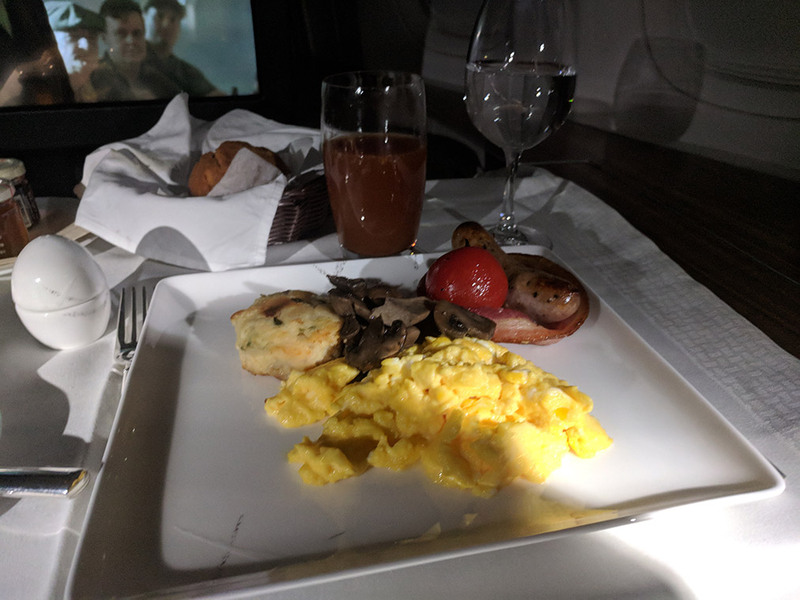 I had the eggs breakfast; it was pretty standard. 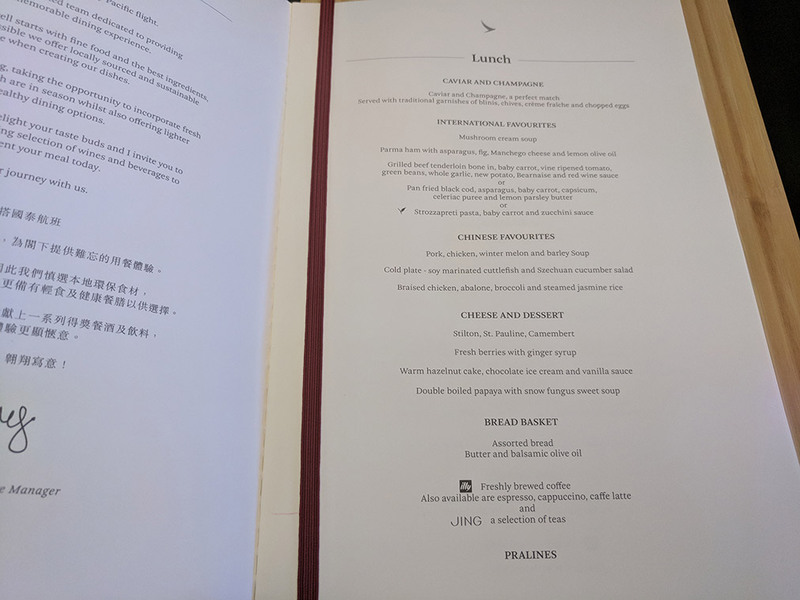 In retrospect it probably would have been a lot more interesting to try the dim sum breakfast. Christy Hansen on Where Can I Pet a Baby Lion / Tiger / Cheetah / Big Cat?